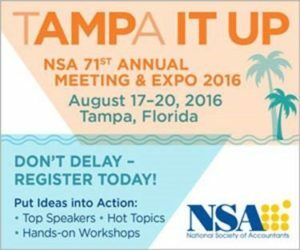 It’s not too late to AMP IT UP and register for NSA’s Annual Meeting at the Grand Hyatt in Tampa this month. The meeting will draw accountants and tax professionals from across North America. Courses at the meeting offer 16 hours of continuing professional education (CPE) and networking opportunities that will help attendees ramp up their marketing, customer service, and growth strategies; reduce risk; save time and money; and increase profits and the value of their businesses. How to Implement SSARS No. 21: The Protocols and Practicalities of the New Standards for the Preparation, the Compilation and the Review. Speaker: Joseph Santoro, CPA, ABA, the 2015 NSA Accountant of the Year, Gear-Up presenter from 1994 – 2015, and now a presenter for Bob Jennings Tax and Accounting Seminars. Retirement; Estate Planning for the 99% & Common Estate Planning Mistakes. Speaker: Steven G. Siegel, JD, LLM, president of The Siegel Group, which provides consulting services to attorneys, accountants, business owners, family offices and financial planners. For Saturday, August 20, courses and speakers are shown below. Each speaker will also lead two roundtables as a follow-up to their session. Time Management in Your Practice. Speaker: Jeffrey A. Schneider, EA, CTRS (Certified Tax Resolution Specialist), a National Tax Practice Institute (NTPI) Fellow and principal at SFS Tax & Accounting Services. He will also lead two roundtable discussions on this same topic. Positioning Your Practice for Growth. Speaker: Katie Tolin, founder of CPA Growth Guides, LLC and a past president of the Association for Accounting Marketing. She will also lead two roundtable discussions on overcoming obstacles to specialization and which growth strategies produce the greatest return. For the past two years, Accounting Today named Tolin one of the top 100 most influential people in accounting, and she was one of CPA Practice Advisors’ Most Powerful Women in Accounting in 2015. 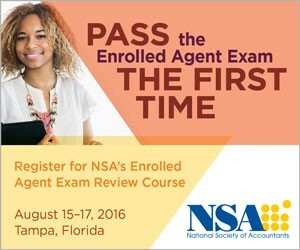 NSA is also offering a preconference Enrolled Agent (EA) Exam Review Course August 15-17. It is an intensive course designed to help attendees master the tax basics and is proven to help them pass the EA exam the first time. Detailed study notes will be provided for each topic, including figures and charts that prove the old adage that “…a picture is worth a thousand words.” Hundreds of past exam questions from the open-exam era and many more potential questions on newer topics are incorporated and each is reviewed in class so the real exam itself will look like an old friend. Study tips, tricks and shortcuts are a staple of this course. John O. Everett, CPA, Ph.D., Professor Emeritus of Accounting at Virginia Commonwealth University in Richmond, VA.
Bill Duncan, CPA, Ph.D, Associate Professor of Accounting at Arizona State University. He was formerly a Director with Ernst & Young where he guided tax education for the firm. An Accredited Tax Preparer (ATP) Exam Review Course – also taught by Everett and Duncan – will take place on August 15 with the optional exam given on August 16. Earning the ATP credential from the Accreditation Council for Accountancy & Taxation (ACAT) exempts practitioners from taking and passing Annual Federal Tax Refresher courses and exams each year, which are a component of the Internal Revenue Service (IRS) Annual Filing Season Program (AFSP). NSA is approved as an official provider of CPE by the National Association of State Boards of Accountancy (NASBA), Internal Revenue Service (IRS), Accreditation Council for Accountancy & Taxation (ACAT) and California Tax Education Council (CTEC). 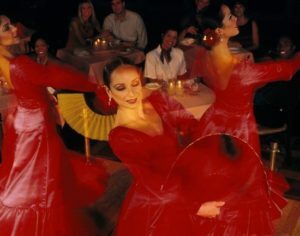 The meeting offers many networking opportunities and social events, beginning with the Welcome Reception on August 17 and concluding on April 20 with an exciting dinner and show, “Experience the Fire of Flamenco,” at the original Columbia Restaurant – Florida’s oldest continuously operating restaurant – in Tampa’s historic neighborhood of Ybor City. Full Annual Meeting registration packages are now available for $679 for NSA members and $825 for nonmembers (including a full year of NSA membership) until July 8. A lower-priced two-day education registration option – which includes programs on August 18 and 19 only – is also available for $499 for NSA members and $550 for nonmembers until July 8. NSA is approved as an official provider of CPE by the National Association of State Boards of Accountancy, Internal Revenue Service, ACAT and California Tax Education Council. For more information and to register, visit www.nsatampa2016.org or contact NSA at 800-966-6679 or members@nsacct.org. Choose Any 1 Part or All 3!